A translation of the ancient classic Stages of Meditation, by Kamalashila, with commentary from everyone's favorite Buddhist teacher, the Dalai Lama. The Dalai Lama explains the principles of meditation in a practice-oriented format especially suited to Westerners. Based upon the middle section of the Bhavanakrama by Kamalashila—a translation of which is included—this is the most extensive commentary given by the Dalai Lama on this concise but important meditation handbook. It is a favorite text of the Dalai Lama, and he often takes the opportunity to give teachings on it to audiences throughout the world. In his words, “This text can be like a key that opens the door to all other major Buddhist scriptures.” Topics include the nature of mind, how to develop compassion and loving-kindness, calm abiding wisdom, and how to establish a union of calm abiding and special insight. 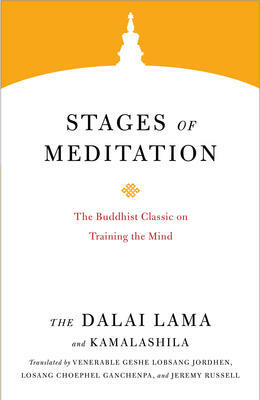 The Dalai Lama explains the principles of meditation in a practice-oriented format especially suited to Westerners. Based upon the middle section of the Bhavanakrama by Kamalashila--a translation of which is included--this is the most extensive commentary given by the Dalai Lama on this concise but important meditation handbook. It is a favorite text of the Dalai Lama, and he often takes the opportunity to give teachings on it to audiences throughout the world. In his words, "This text can be like a key that opens the door to all other major Buddhist scriptures." Topics include the nature of mind, how to develop compassion and loving-kindness, calm abiding wisdom, and how to establish a union of calm abiding and special insight.